Lupita Tovar was an early cinematic Mexican sensation. Best known for her role in a Spanish version of the original Dracula, she was later known in Hollywood circles as Lupita Kohner, a prominent hostess, and wife of agent Paul Kohner. 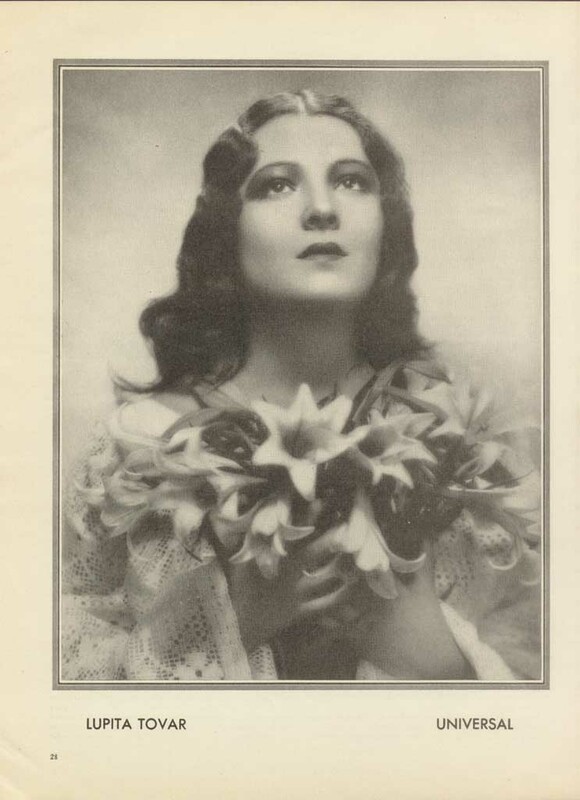 Tovar’s ascendance as the Sweetheart of Mexico was curbed by the emergence of talkies, a departure from the silent film industry in which she was poised to become a mega-star. Although Lupita did not make any silent films, with her earliest movies released by Fox Film Corporation in the Movietone sound-on-film system, some may have been released in silent versions for theaters, not yet equipped for sound. She also worked at Columbia Pictures. Her skills were used in Spanish-language versions of Hollywood fare. The productions were made at Universal Studios, with the Spanish-speaking crew working overnight after the English-language cast had clocked out. The idea — often credited to Universal executive Paul Kohner, Ms. Tovar’s future husband — was to tap into the Latin American market demand for sound films, at a fraction of the cost of the originals. In the early days of Hollywood, it was common for cinematic studios to produce their foreign language versions of their screenplays, usually in Spanish; but also in French, Italian, and German, using the same costumes. Tovar didn’t much care for Dracula’s grueling schedule. That version, produced in 1931, was filmed at night on the same sets that were being used during the day for the English-language Dracula with Bela Lugosi. The alternate version is considered a superior motion picture by many by film historians. It was thought to be lost until a print was discovered in the 1970s and restored. In 2015, the Library of Congress selected the flick for preservation in the National Film Registry, finding it culturally, historically, or aesthetically significant. She amassed 31 credits over 16 years, including a starring role in the 1932 film Santa, an early Mexican talkie and commercial breakthrough that heralded Tovar’s status as a national treasure. In 1982, her face even made it onto a postage stamp. In 2006, Santa was shown in a celebratory screening by the Academy of Motion Picture Arts and Sciences, part of their retrospective called A Salute to Lupita Tovar. Tovar is also the matriarch of several generations’ worth of Hollywood nobility, including her Oscar-nominated daughter, Susan Kohner (for Imitation of Life), and her grandsons Chris Weitz and Paul Weitz, who wrote the Academy Awards-nominated screenplay, About a Boy. An original, Lupita Tovar was 106. This entry was posted on Monday, November 14th, 2016 at 12:15 am	and is filed under Blog by Manny Pacheco. You can follow any comments to this post through the RSS 2.0 feed. Responses are currently closed, but you can trackback from your own site.